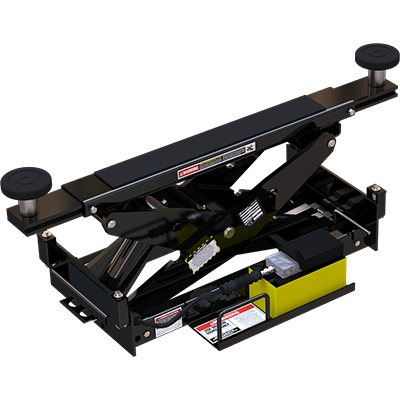 A rolling bridge jack is the only way to turn a four-post lift into a full-service car lift. 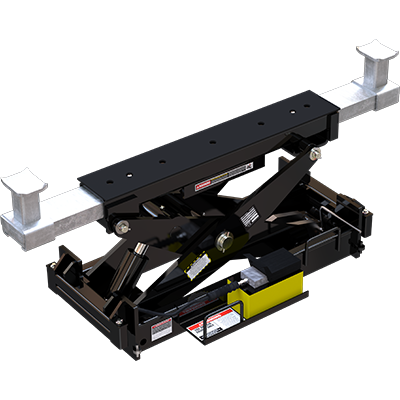 Each frame-engaging jack lifts one-half of your car, and two will raise all four wheels off the runways. Wheel service becomes a cinch, and your BendPak might be the last lift you ever purchase for service and vehicle storage. BendPak offers seven rolling bridge jack models that are designed to hold between 4,500 lbs. and 25,000 lbs. each. Each jack is placed on top of a four-post lift, so it can ​slide between the runways. It elevates the frame of your vehicle to permit access to the wheels. 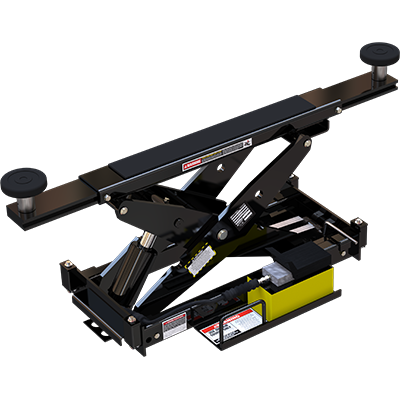 Bridge jacks help get the most out of your car lift and dramatically increase your service abilities. You'll be able to change tires without sending your wheels across the street. Simply balance them on your own wheel balancer. 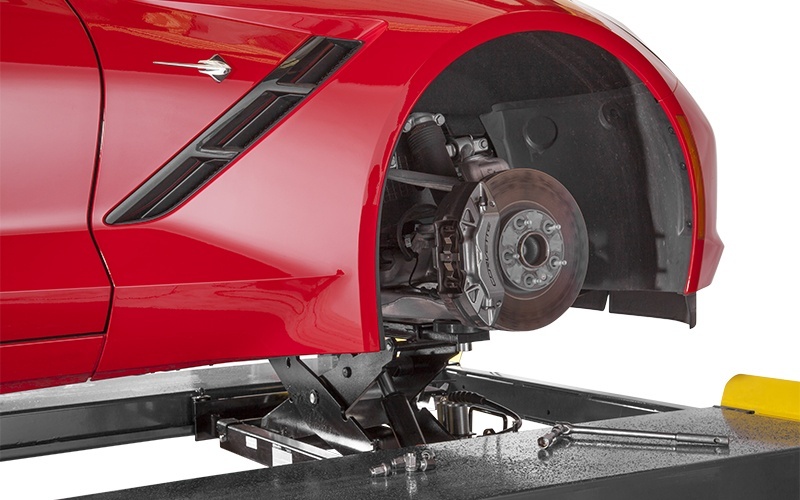 If you purchased an alignment lift and wheel aligner, you can perform full alignment services after returning fresh, balanced tires and wheels to the car. By not having to change lifts, you revolutionize your workflow with greater efficiency, and ultimately, more profit. Starting at $1435 + FREE SHIPPING! Starting at $1485 + FREE SHIPPING! This 7,000-lb. 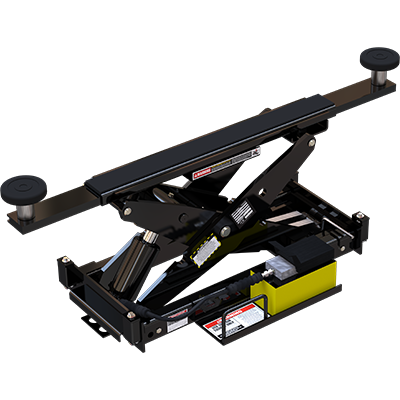 capacity rolling bridge jack is made for an HD-14 four-post lift. Each rolling jack comes complete with three safety-lock positions and stackable pad adapters to provide added clearance when needed. Starting at $1635 + FREE SHIPPING! Starting at $2110 + FREE SHIPPING! Our 15,000-lb. capacity bridge jack is made just for the HDS-35 four-post lift. This particular car lift is truly made for massive trucks and commercial equipment. Check out the RBJ15000 jack if you need to perform full wheel service on heavy-duty vehicles. Starting at $3255 + FREE SHIPPING! Starting at $4545 + FREE SHIPPING! Starting at $4810 + FREE SHIPPING! 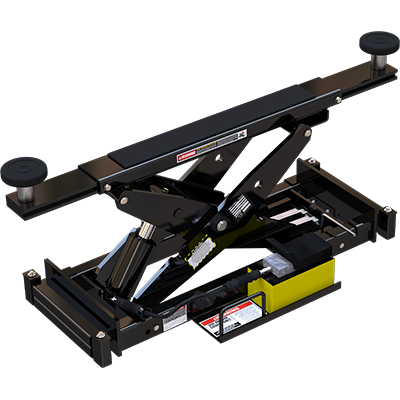 BendPak's scissor-style rolling bridge jacks offer peerless jacking speed and convenience. One unit provides you with the ability to raise two wheels off the lift runways, while two jacks can lift the entire car for full wheel service. Their exclusive telescoping roller design adjusts to different tread widths, so you don’t need an adapter to work on a variety of vehicles. Reaching factory-approved jacking points has never been easier, and precision rollers enable you to position them anywhere beneath the car. Please note: each jack would ideally lift half the weight of your car or truck, but the center of gravity may not be the dead-center of the lifted vehicle. You must know the weight distribution of each vehicle before placing rolling bridge jacks, so you don’t accidentally overload one of the jacks. In some cases, bridge jacks in the front and back of the vehicle being lifted require different lift capacities. While you can certainly use a single bridge jack effectively in your garage, two jacks work together to effectively replace a two-post lift or scissor-lift. Sliding two hydraulic jacks along the inner lift platforms is effortless. An airline kit will let both units share the same air compressor source without requiring you to unplug or reconnect any hoses. Stackable pad adapters come standard with every purchase. Enjoy the view! Every bridge jack we offer comes with free shipping and a full warranty plan. This means that even if you decide to purchase your bridge jack at a separate time from the purchase of your lift, you're not getting "dinged" for shipping costs on smaller equipment.